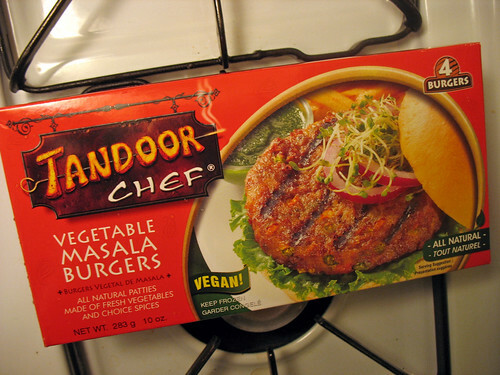 Last month I got an email from Tandoor Chef, an Indian food company that sells a lot of vegetarian and vegan dishes, asking me if I had tried their Vegetable Masala Burger. I told them I had not, and had not seen it in my local grocery stores, so they offered to mail me some samples. How could I say no to that? getting this box in the mail was pretty exciting, I have to say! 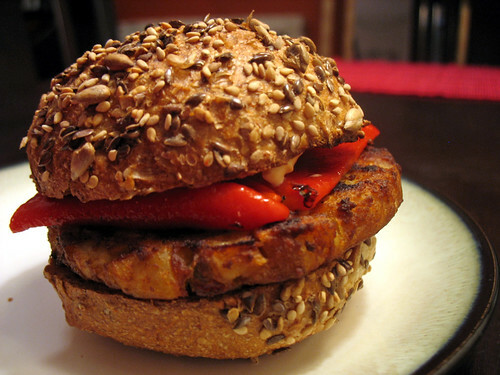 I fried one up on the stove (they cook very quickly, probably faster than the average frozen burger) and loaded it up with roasted red peppers on one of my favorite multigrain rolls. Delicious! 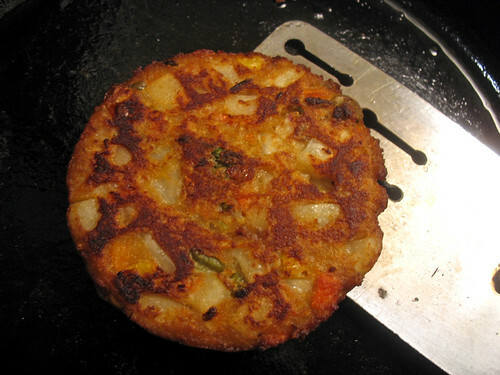 Crispy on the outside, soft on the inside, full of potatoes, carrots, peppers, green beans… And… remarkably similar to the vegetable masala burgers I frequently purchase at Trader Joe’s. In fact, I would swear they are identical. 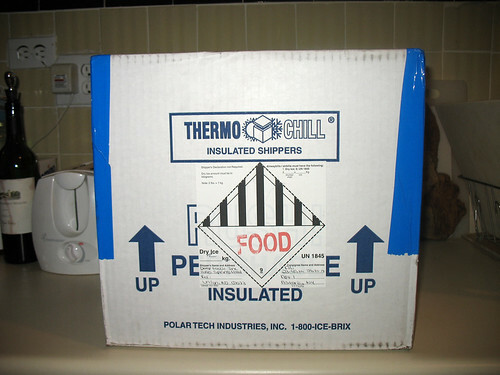 So I grabbed a Trader Joe’s box from my freezer to compare: same ingredients! And also vegan. Hmmm… same burgers? Seems likely to me! Which is good news for people who live in places (like my hometown) that do not have a Trader Joe’s yet, as Tandoor Chef may distribute this product to your local grocery store (check the list of locations on their website). And like I said when I posted my review of Trader Joe’s burgers, they are truly tasty, and a very versatile patty well worth a place in your freezer. I don't know what looks better- the burger or the bun. Ooh, I've seen these in Whole Foods. Now I must buy some! ironically their corporate office is near my home but I can't find Tandoor Chef's masala burgers in any of the 5 supermarkets around me. However I did pick up Trader Joes veggie masala burger so I will have one dinner now instead of lamenting the lack of Tandoor Chef. btw, those rolls really looks plump and tasty. where can I find them? They are 4.99 for 4 burgers. I found them at the local Indian grocery store. most amazing veggie burger ever - paired with a curried mayo delish!! I have been buying this for almost 8 months and I love it. 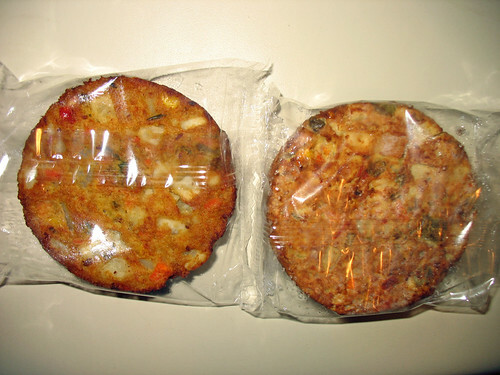 Especially being a vegetarian, I don't get to find tasty treats like these. I am currently buying this from a local Indian store (Delhi Bazaar). Looks like the Tandoor Chef is selling though Amazon and the price through amazon is little expensive ($.75 per individual box) since they have have to ship it with special packaging. They are $3.99 at the Patel Brothers grocery store near me. That's the cheapest I've seen for it in our area. We love them!